Northmen Night at the ACC with the Toronto Rock! There may be snow on the ground, but we're always thinking lacrosse here in Orangeville! * Sticks will be provided. Please bring running shoes, helmet and water. Orangeville has one of the best and most successful lacrosse program's in Ontario. We offer house-league, men's and women's field, and rep box lacrosse programs. Hockey And Lacrosse Are Very Similar Sports. 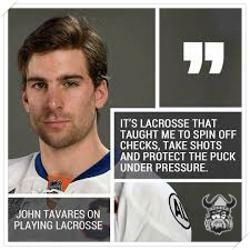 Hockey players excel in lacrosse and, in turn, they become markedly better hockey players. Both hockey and lacrosse are high tempo, physical team sports that have similar elements to the game. Both sports utilize 5 players and a goalie, three periods and strategy of developing odd-man situations to create scoring opportunities. Comparatively, lacrosse is a much less expensive sport than hockey and uses much of the same protective upper body equipment.